CIA Nominee Gina Haspel Faces A Senate Showdown : Parallels Haspel is the first woman nominated for the CIA's top job. Her covert career and links to waterboarding will likely make for an unusual Senate confirmation hearing with an uncertain outcome. CIA director nominee Gina Haspel attends Secretary of State Mike Pompeo's ceremonial swearing-in at the State Department in Washington last week. She is a spy's spy. She spent 32 years undercover at the agency and was named deputy director last year. Much of her life remains shrouded in mystery. There are just a few public photos. The only voice recording NPR found is from a banquet last October, held by the Office of Strategic Services Society, a group dedicated to the World War II agency that preceded the CIA. In brief remarks, Haspel honors the memory of a legendary spy, Hugh Montgomery, who had recently died. Gina Haspel speaks at a banquet last October. Haspel, the nominee to be director of the CIA, was undercover for 32 years at the spy agency and has left little in the way of a public record. The CIA is only selectively lifting the veil on Haspel's long career. Haspel, 61, joined the agency in 1985, a few years after graduating from the University of Louisville. She has held 20 separate jobs, including seven foreign postings. The positions are only identified by region — Africa, Europe and Eurasia. Although, the languages she learned at the CIA — Russian and Turkish — offer additional clues about her assignments. "Gina will bring to the table a personal and granular knowledge of what it's like to be an operator, to go down the dark alley and meet a source," said Frank Archibald, who was the CIA's director of clandestine services before he retired three years ago. Haspel was his deputy. But personal testimonials aren't enough, says Sen. Ron Wyden, an Oregon Democrat. "I'm very familiar with the classified material. I think the vast amount of this can be declassified," said Wyden, who is on the intelligence committee that will question Haspel on Wednesday. "I think the agency is covering up her background, because if the American people knew what I knew, I think there would be many senators who would say, 'Look, there's no choice but to reject her confirmation,' " said Wyden. The Washington Post reported Sunday that Haspel was willing to step down Friday rather than go through a grilling by senators that could embarrass her and the agency. But White House officials persuaded her to press ahead, and she remains on track for the Wednesday hearing. An administration official involved in the Haspel confirmation process declined to discuss specifics of the Post story but acknowledged "Friday was a rough day." The official said that Haspel will meet with five or six senators Monday and Tuesday and that CIA will provide senators a classified briefing book with details of Haspel's agency career. At the CIA, spokesman Ryan Trapani said, "Those who know the true Gina Haspel — who worked with her, who served with her, who helped her confront terrorism, Russia and countless other threats to our nation — they almost uniformly support her." He added: "When the American people finally have a chance to see the true Gina Haspel on Wednesday, they will understand why she is so admired and why she is and will be a great leader for this agency." Haspel has taken on some of the toughest jobs in counterterrorism. A high point came in 1998 when she was a station chief in a country the CIA won't name. After the deadly al-Qaida bombings at U.S. embassies in Kenya and Tanzania, Haspel worked closely with the country where she was based. The CIA said this led directly to the arrests and imprisonment of two key al-Qaida members. "I never saw a moment be too big for Gina. Because she had the resilience, based on her personal character, to say whatever the bad guys throw at us, we're going to come back, and we've got a plan, and we can manage this, we can go forward," said Archibald. Haspel's most controversial moments came a few years later. Daniel Jones was a Senate intelligence committee staffer at the time. He said that revelation prompted senators to call for an expanded investigation. The result was the Senate's so-called torture report that he helped write. The full report, along with a declassified version, were released in 2014. "The creation of that cable by Gina Haspel, and her advocacy for the destruction of the tapes, really led to the eventual 7,000-page [classified] report," said Jones. Today the law is clear. Waterboarding is illegal. The CIA says it's out of the interrogation business, something Haspel has been telling senators in private meetings. But her nomination has raised the issue anew, says Chris Anders of the American Civil Liberties Union. "Gina Haspel is unique. She is the only one who has been nominated for office who had an operational role in the use of torture," Anders said. If confirmed, Haspel will be the first CIA chief in decades who has spent her entire career at the agency. She has strong support from CIA veterans like Jeanne Tisinger, who is retired from the agency. "The way I'd like to think about it is that Gina being the first female [director of the CIA] would be a footnote and not the headline," said Tisinger. "Gina is incredibly well-qualified and, simply put, is the best choice for the role when you look at her smarts, her experience, her integrity, her wisdom, her steady hand." But Wyden says the debate needs to be more public. "You ought to have an open debate about a nominee. A nominee ought to take public responsibility for their actions. And senators have to answer to an informed public for their votes," he said. 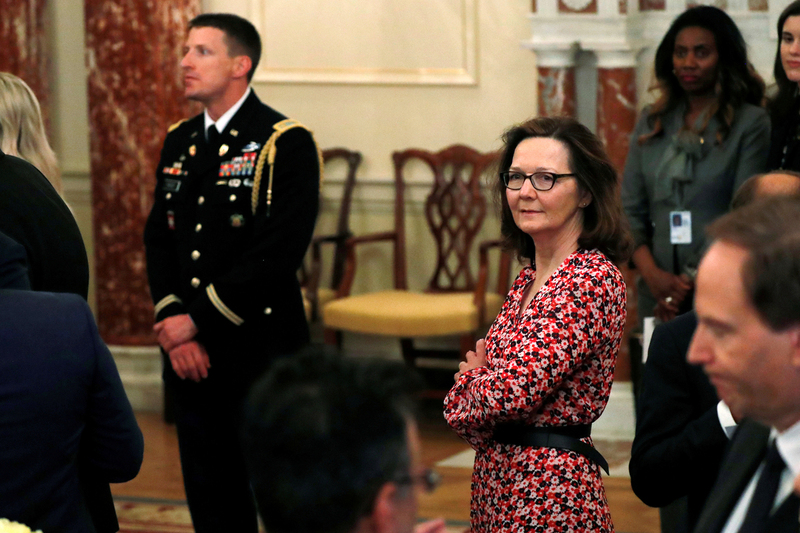 Haspel's hearing on Wednesday is set to have both an open and a closed session. The White House, which is lobbying hard for Haspel, says it expects a very close vote.